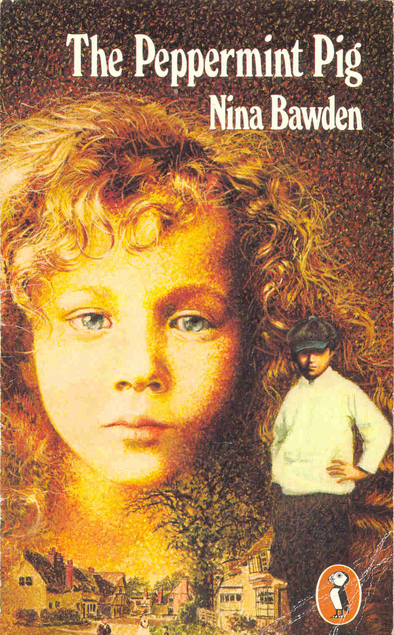 The Peppermint Pig by Nina Bawden was first published in 1975 and it’s one of the Puffin books that I bought fairly recently. It won the Guardian Award for children’s fiction. This book isn’t for the faint hearted as at the very beginning there’s a description of how Granny Greengrass had her finger accidentally cut off by the butcher. Then it’s mentioned that puppies used to have their tails ‘docked’ by having them bitten off by the groom at the Manor House. The father of the Greengrass family is got rid of very quickly as after an incident at his work he decides that he should travel to America where his brother lives, in the hope of forging a new life for his family – eventually. The children and their mother end up having to leave their home in London and travelling to rural Norfolk to live with aunts until the time comes for them to leave for America. Life there is very different from London, they end up having a pet piglet, the runt of a litter which was offered for sale to their mother for a shilling. In no time the piglet is house-trained, he’s clever and naughty and great fun, the children love their peppermint pig which is apparently what the runt of a litter is called. The piglet grows quickly, as the children were so fond of it I really thought that this was going to have a happy ending – but I was wrong! The blurb on the back says: A charming and perceptive story by the author of Carrie’s War. I imagine that it probably turned a fair few children into vegetarians – for a while anyway!